Dolls, to the left allow your eyes to graze over the beauty that is Rebecca Taylor’s Bustier Combo Dress; to the right prepare yourself to fall in love with Charlotte Russe’s sophisticated Solid Navy Dress with Chiffon Bust. Though the charming Charlotte Russe selection lacks the fluttering cap sleeves of the tantalizing Taylor, and proffers an exposed back zipper to toughen up an otherwise feminine look; for just $34.50, in comparison to the $350.00 needed to scoop up Taylor’s tempting frock, it is the ideal way for the fashionista that is vous to add a little haute couture style to her closet – on a frugalista budget! Thanks to Shopbop and Charlotte Russe for the pictures. Don't forget to enter the Kiss Me Through the Phone Giveaway for your chance to win an AUTOGRAPHED copy of Debra Goldstein and Olivia Baniuszewicz’s Flirtexting: How to Text Your Way to His Heart. I have to say that I like the one from Rebecca Taylor better but both of them are wonderful! Charlotte Russe looks like a better fit and color, I'd choose that. I usually go for the less expensive version because I am a frugal fashionista, but I have to say I love the Rebecca Taylor dress 100x more than the Charlotte Russe dress. I love the shape of the Charlotte Russe, better. I do love the style of the CR. That dress is actually so cute! I'll take either! Charlotte does it amazing this time! So love the CR style of this. 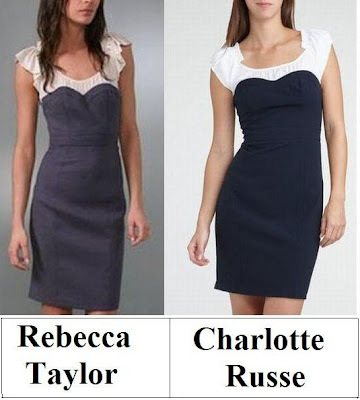 I am sure the Rebecca Taylor one is better quality, but the Charlotte Russe one is my pick. i like the details in the Rebecca Taylor, but what a great deal for the Charlotte Russe dress. wow, I never thought I'd say this but I actually prefer the cheaper option. very cute dresses... i love the ruffly sleeve though! ha! it's difficult to say what the rebecca taylor one would really look like, as the bustier doesn't seem to fit the model at all... the charlotte russe one looks great though! I'm loving the outfit to the right, and again, your header. Thanks for sharing the photos and drop by me too when you have time. I absolutely adore Charlotte Russe. Great store! I really love the fit and the cut of the CR version. Hope you have a great Sunday, E.
That looks similar to the dress Rene Russo wore in the Thomas Crown Affair 1999. I like the more feminine feel of Rebecca Taylor's, but the Charlotte Russe is obviously more budget friendly. So feminine, reminds me of my D&G dress! I love them both! Gotta go with Rebecca Taylor on this one -- so clean and chic! Very neat silhouette. They both look too similar for me to choose one! I like the Charlotte Russe one better. I like the cleaner lines and the darker shade of blue. It seems sharper for some reason. Sharing Lots of Love n Fun! I think I like the Rebecca Taylor version better! I like the Charlotte Russe one better! still getting used to inner wear styles being worn on the outside. that said, both seem very comparable! (the ruffles on the shoulder are nice). I like the length of the expensive but the fit of the cheap! Give me those too for a price in between? SOLD!! Thanks for visiting me so faithfully!! I like the top better on the Rebecca Taylor version, but the Charlotte Russe version is cute and much more affordable. You know what I love? The fact that it covers. I know I sound way old school, but I love the more modest look. Nothing hanging out and I like that! Ladylike but not boring. I love the style of the dresses. They're both gorgeous and really similar. I'd defintiely pick the Charlotte Russe one. I'd like both versions, please! i still think the rebecca taylor one is better ! the details on the sleeves are to die for ! I love the charlotte russe version!! Definitely thrifty on this one!! Love the CR version!! I like the Rebecca Taylor dress. Cute look. You know, despite the not-so-great quality, Charlotte Ruesse consistently has really cute stuff. Last week, I got four pairs of ballet flats for forty bucks. They are adorbs. I feel like CR is good for going out stuff or super trendy things.